Electrostatic (ESLs) speakers are simple in design, the first patents were around 1929. It took until the late forties when (Arthur Jenszen), and thru mid-fifties (Peter Walker of Quad), made use of a new diaphragm materials strong and light enough was developed to make high quality audio sound output, but were still difficult to build. A thin plastic diaphragm, made of Mylar, is stretched on frame. 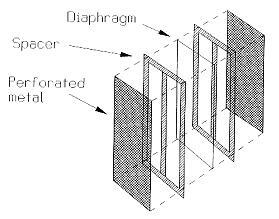 The diaphragm is then attached between two metal perforated plates called "stators" with spacers used to keep the diaphragm and stators a exact distance from each stator and each panel may have multiple cells. ESLs must have a special wound impedance matching step-up transformer wound with many layers of wire on the secondary for matching the low impedance output of an audio power amplifier to the very high impedance of the ESL panels. The ESL transformers are similar to output transformers used for tube amplifiers but hooked up in reverse. ESLs also need a special high voltage DC bias supply. The incoming music signal from an audio power amplifier is connected to binding post and the primary of the step-up transformer. The secondary winding of the step-up transformer is connected to the two stators, one wire to the front and one to the rear. A small transformer for the bias is connect to a wall outlet to supply either 110 or 220 AC volts to the primary of the transformer this drawing very low current in the milliamp range and is used along with capacitors and diodes to form a voltage multiplier. The high voltage 2,500 volts DC bias supply is connected to a center tap on the audio step-up transformers secondary winding, with the negative end going to the transformer center tap and the positive end going to the diaphragm. The Mylar diaphragm has an special electrically conductive coating applied, and when the bias supply is turned on, the diaphragm is charged up with electrons. The electrons don't flow anywhere, but just sit there at a consent positive DC state. The secondary winding of the audio step-up transformer will increases the power amplifier low output voltage of a few volts to fifty volts depending on the turns ratio (1:80 with the M299a transformer) to upwards of about 4,000 volts AC, when a audio music signal is applied the alternating positive and negative signal to the front and back stators cause the positively charged diaphragm to move back and forth, pushing air through the perforations in the stators, thus giving us the sound we hear. due to our continuous research and development program.